Hillary Clinton speaks at the Cookstoves Future Summit on Nov. 21 in New York. Most speculation about the 2016 presidential election has taken at least one thing for granted: Hillary Clinton will run. But the Cook Political Report’s Charlie Cook recently threw some cold water on that assumption (or at least some lukewarm water); Cook estimated Clinton has only a 60 to 70 percent chance of running. I have no clue whether Cook’s estimate is right. But recent data illustrates why Clinton might balk at running: She no longer looks quite so invincible, and early indicators point toward a Republican-leaning political environment. We’re still a long way from the 2016 election, but Clinton needs to decide soon whether to run. The political landscape right now is more Republican-leaning than at a comparable point in the 2012 cycle (when President Obama, with a 46 percent approval rating, led a generic Republican 42 percent to 39 percent). Obama’s approval has dropped to 42 percent. In four polls conducted over the past month, YouGov asked more than 2,500 registered voters whether they would vote for the Democratic or Republican candidate for president in 2016. The Republican candidate led, on average, 39.2 percent to 36.7 percent. Again, these results are among registered, not likely, voters, so this lead has nothing to do with turnout. The current environment suggests Clinton would need to be stronger than a generic Democratic candidate to be considered the favorite. Instead, her standing has deteriorated. YouGov has been polling Clinton’s favorable ratings among adults over the past six years (adults overall tend to be more Democratic leaning than just registered voters). Clinton was quite popular during her days as secretary of state. 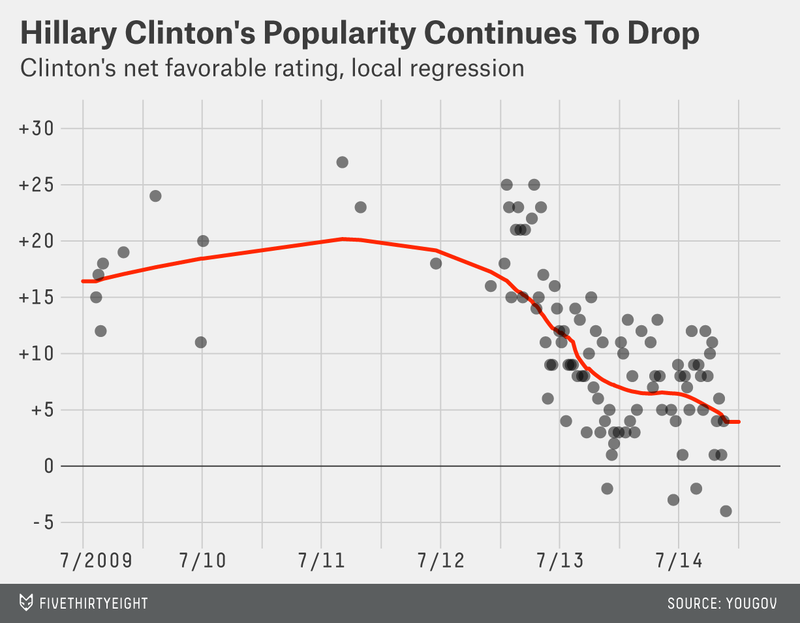 But since leaving that nonpartisan post in 2013, her net favorable rating has been falling. The most recent YouGov poll put her at an all-time low. YouGov’s results have been echoed by other pollsters, including NBC/Wall Street Journal and Quinnipiac University. The most recent NBC survey found Clinton’s net favorable rating at +3 percentage points; Quinnipiac had it at +5 percentage points. Clinton’s edge against Republicans in a potential 2016 matchup has also taken a hit. She once led by double-digits in matchups against most Republicans. But recent live telephone polls in the key swing states of Iowa and New Hampshire have Clinton neck and neck with 2012 Republican nominee Mitt Romney. Nationally, Quinnipiac found Romney leading Clinton 45 percent to 44 percent among registered voters. At a comparable point in the 2012 cycle, Romney was down 7 percentage points to Obama. Clinton led New Jersey Gov. Chris Christie by 1 percentage point, and she holds leads of 4 to 9 percentage points on the other Republican candidates. Any lead Clinton does have is almost entirely attributable to being better known. In the Quinnipiac survey, 95 percent of respondents recognized her name. Only Romney, with 86 percent name recognition, comes close to being as well-known (and he’s the only candidate who leads Clinton). The rest of the GOP field has name recognition at 71 percent or below. Among the seven Republican candidates listed by Quinnipiac, the correlation between Clinton’s lead (or lack thereof) over each Republican and that Republican’s name recognition was 0.94. In other words, other Republicans should gain ground as they become better known. In fact, a simple regression between name recognition and a Republican’s standing against Clinton in the Quinnipiac poll suggests that she isn’t performing much better than a generic Democrat. None of this means that Clinton would lose if she ran. Polls at this point are not very predictive. Obama may become more popular. The Republicans could nominate an extreme candidate. Any number of other things could happen. Clinton, however, no longer looks like such a juggernaut. Not only are her numbers dropping, but she is running on par with a Democratic brand in its weakest shape in a decade.